I have plenty of foxgloves blooming this year. Conditions were not as favorable for the bearded iris or the mock orange. None of my bearded iris bloomed, and only one late variety bloomed for Bub. I think we got one of our infamous late hard freezes at the critical moment in iris bud development. Probably the same thing for the mock orange, which had a few sparse blossoms but not covered like it is some years. No, I didn’t prune it last year, so that’s not it. But I don’t see blasted buds on the mock orange like I do on the iris, so I’m not as confident that it was the cold. Every year, something does well and something else does poorly. 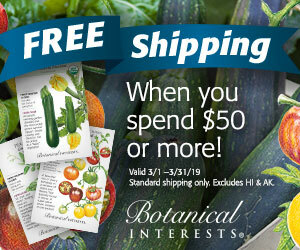 It’s part of what makes gardening interesting, right? In general, everything that managed to dodge the hard freezes bloomed earlier than usual. The first Oriental poppy and the first peony both bloomed on May 27th! How can I call them the grandes dames of June if they start blooming in May? 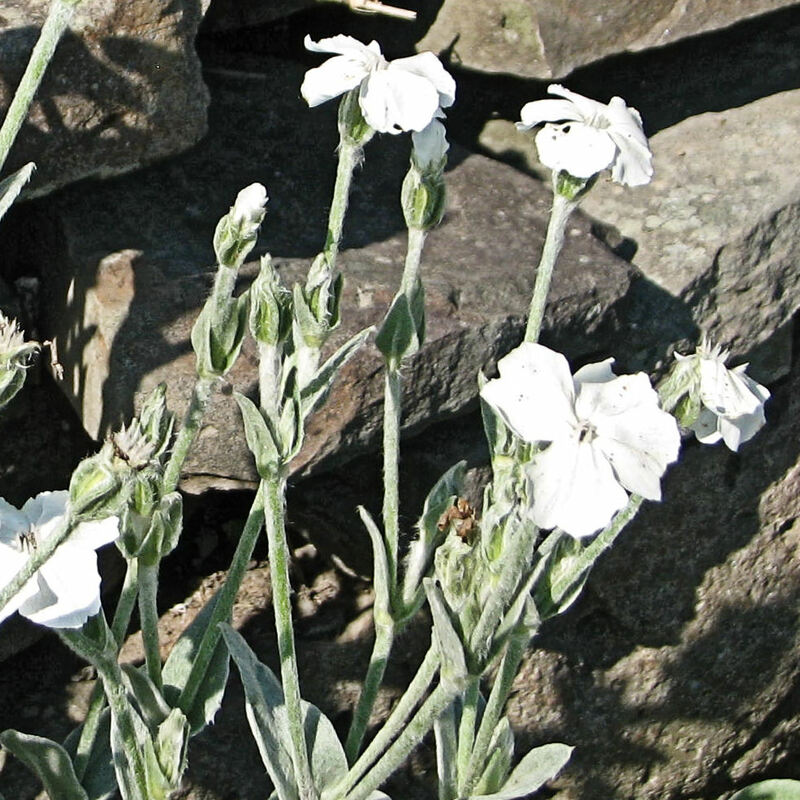 Don’t try to answer that–it’s sort of like calling Lychnis coronaria alba white rose campion. 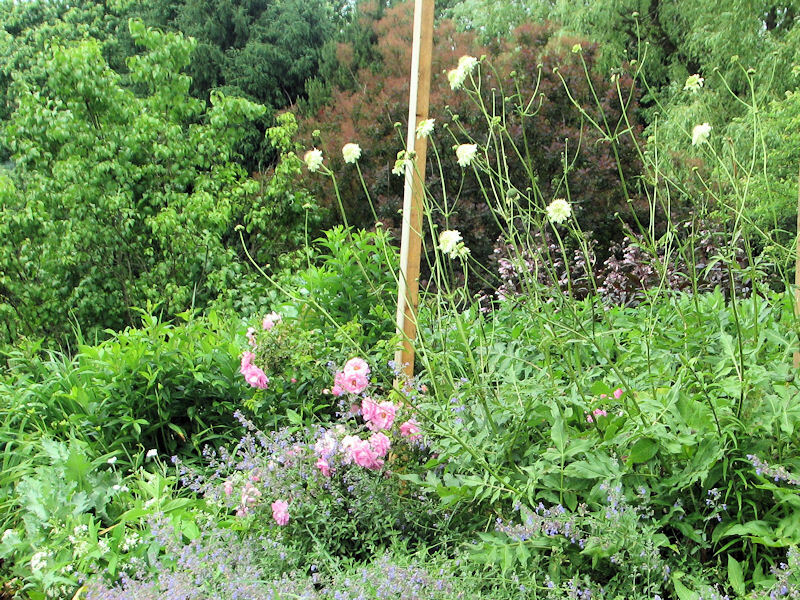 These three plants, the catmint, the ‘Cape Diamond’ rose, and Cephalaria gigantea, don’t always bloom together, but when they do, the effect is a bit less than what I hope for. I think the cephalaria (aka giant scabious) is just too tall. They would look better together in a vase, or perhaps if the cephalaria were behind the rose instead next to it. Or maybe I should grow Scabiosa ochroleuca again. But I think there was a problem with that, too–it was too short, and overwhelmed by the catmint. 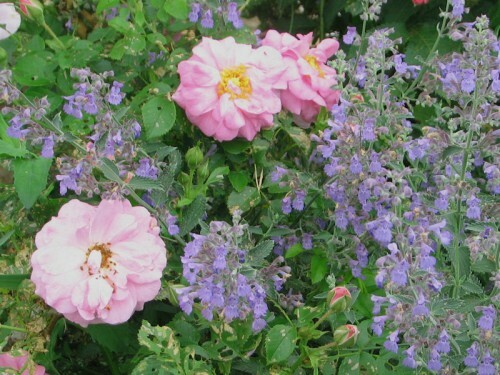 In the first image of the catmint, rose, and cephalaria, that two by four sticking up? That’s holding up the roof of our dismantled porch. Renovations are in progress, and because the porch is missing, you can see the penstemon that is around the corner and normally can’t be seen. Just like last year, this penstemon is blooming ahead of the Lauren’s Grape poppies that surround it. Those poppies are filled with buds, and I can hardly wait! Inspired by the words of Elizabeth Lawrence, “We can have flowers nearly every month of the year,” Carol of May Dreams Gardens started Garden Bloggers Bloom Day. 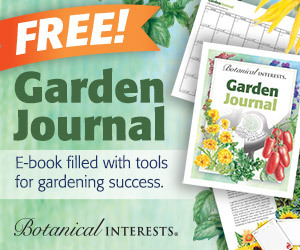 On the 15th of every month (I know, I’m late), garden bloggers from all over the world publish what is currently blooming in their gardens, and leave a link in Mr. Linky and the comments of May Dreams Gardens. Takes me back to my childhood. I grew up in the North of England. I have been living in Sub Tropical Australia for 40+ years now. Don’t see to many Foxgloves here. Thanks for a great post. .-= Alan´s last blog ..How to Properly Grow Strawberries Using a Container =-. Very impressive! 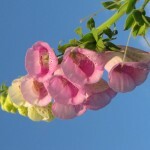 I love the foxglove, mine does behave like a try biannual and does not bloom this year. Let’s hope the best for next year. 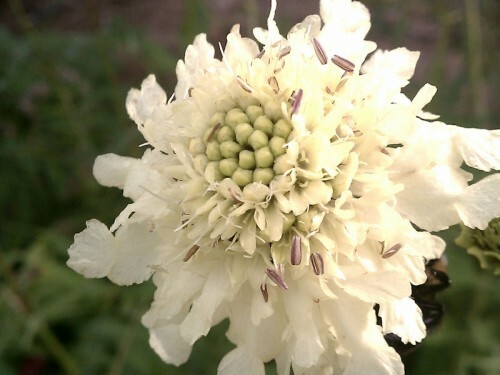 Please share the name/variety of the giant scabiosa – the photo is beautiful! Your cell phone takes great photos! .-= Cheryl´s last blog ..Together is a wonderful place to be =-. Ah, your William Shakespeare is already in bloom. Mine is just a bunch of buds and I’m hoping it will bloom before the adjacent delphiniums peter out. It would be a gorgeous combo. .-= VW´s last blog ..Bearded Iris in Pink, Blue and Violet =-. 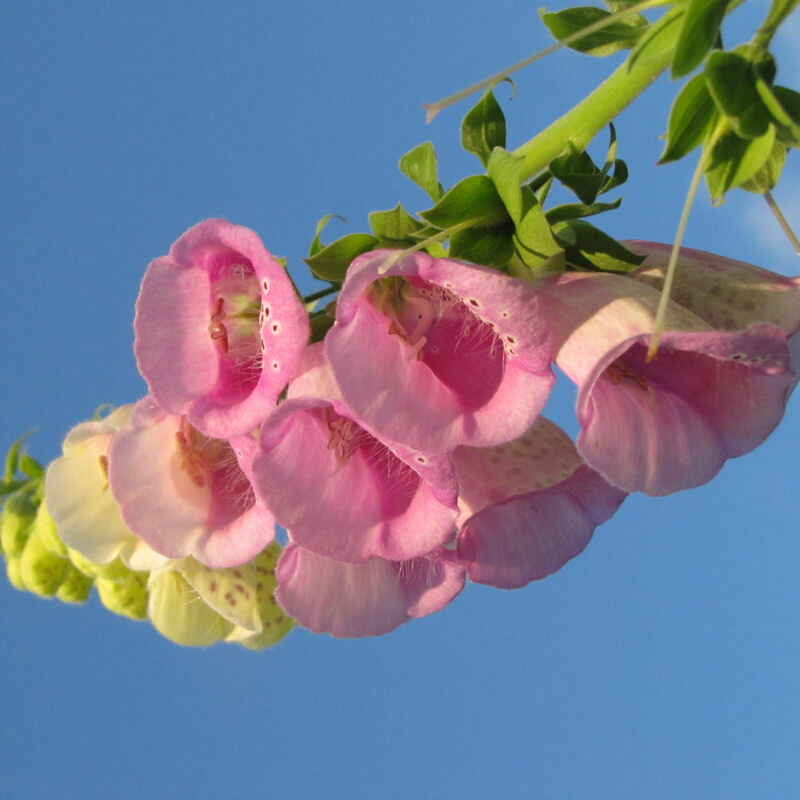 It has been a banner foxglove year here also. They are starting to fade now but their stately presence has been thoroughly enjoyed. Beautiful! That penstemon is gorgeous, and I’ve grown Lauren’s Grape poppies so I can totally envision how rockin’ that combo is going to be! PS: My digitalis self seeds like crazy. 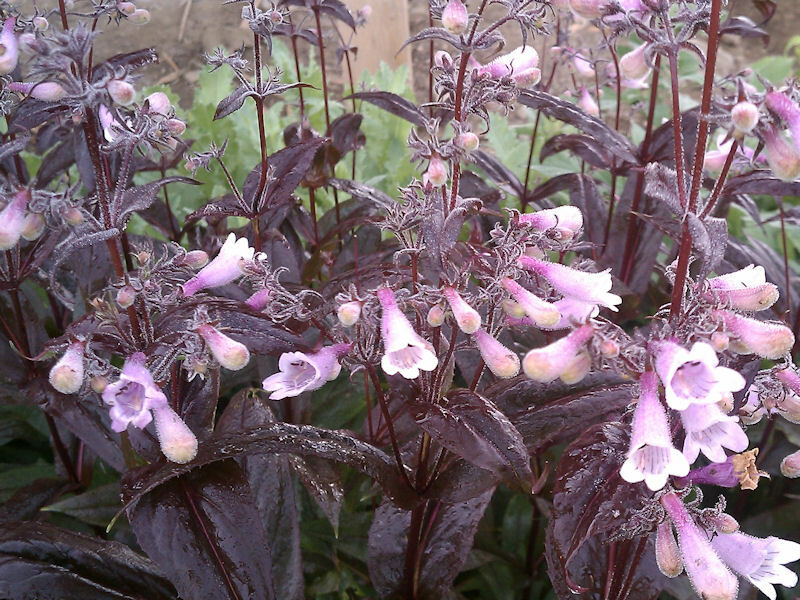 That penstemon is fantastic and so is the quality of your cell phone pictures. It has an 8 megapixel camera on it, more than my “good” camera. .-= Cyndy´s last blog ..Open in Seattle II =-. That penstemon is fabulous. Your gardens inspire me. Now I have to do research to see if these beautiful blooms will live in my area. I enjoy your posts and always learn something. .-= Patsy Bell Hobson´s last blog ..Garden Bloggers Bloom Day June 2010 =-. I agree, the garden is different from year to year, it’s never boring. 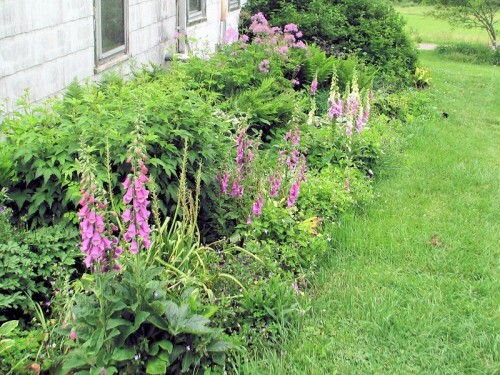 The foxgloves look wonderful. I wish I could grow them. It seems to be a bad year for poppies here. Only one plant has made it from seed to stature, and it doesn’t have any buds yet, so yours are ahead of mine.